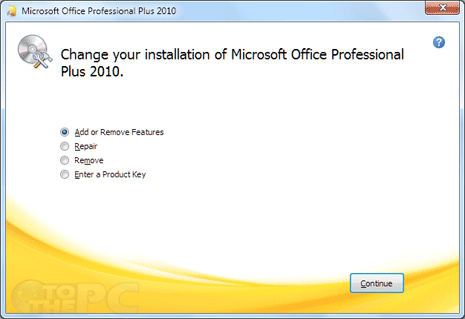 Do you want to uninstall or remove Microsoft Office 2010 software installed on the computer? User may want to remove MS Office for re-installing it again in order to fix specific error. Alternatively, you can attempt to repair copy of Microsoft Office 2010 installed on the computer instead of removing or uninstalling it. You can easily get going with process of MS Office repair or removal from the Control Panel. 1. Click Start (Orb) button and then click to open ‘Control Panel’. 2. 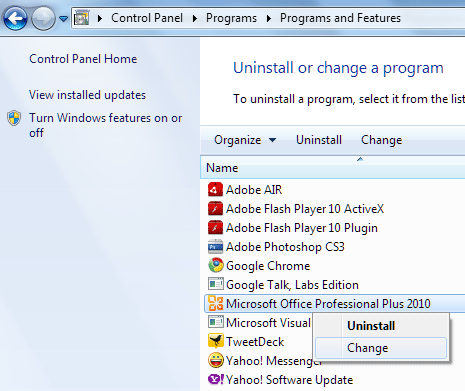 In the ‘Control Panel’ click ‘uninstall a program’ option under ‘programs’. This will show list of programs that you can remove or change. 3. Right click on ‘Microsoft Office’ listing and then click ‘change’ option. Microsoft Office dialog box will open giving you options like: remove, repair, add and remove features, enter a product key. 4. To repair, click to select ‘repair’ option. Then click ‘continue’ button and follow on-screen instruction to complete repair process. 5. To remove or uninstall Microsoft Office, select ‘remove’ option and then follow on-screen instructions for complete removal. Hey, I use the Google search frequently and once I visited an office repair site, where I noticed a good software, which to my great surprise solved my old issues with word documents.